← Twelve Tips for Tackling the Third Trimester Plus a GIVEAWAY! Girls, email me your mailing addresses & I’ll get those certificates to you asap! When it rains, it pours, right? We’ve been hearing this little phrase a lot lately. Our dog began limping again on a knee that was completely replaced in doggy surgery four years ago. The hose to our kitchen sink sprayer sprang a leak and my sweet, wonderful, talented husband tried to fix it himself, but being good at a great many things, handy-manning is not one of them. So, I was without a kitchen sink for a few days. We had a medical emergency with a close family member. My three year-old opened the pantry to get a snack and the cabinet door fell off. Just fell off. My doctor broke his hand skiing and won’t be able to deliver our baby. Most of this all happened within a week. All of these thoughts were sinful. Flat out. But then I had this thought– what are my blessings? Yep, I started counting them. And they outweighed the chaos, of course. Then Sunday rolls around and our Sunday school lesson speaks to me in such a way that I know God has been hearing my prayers these past few weeks and he’s reminding me that even in the pouring rain, I’ve got the best umbrella. The jist of the lesson centered around the idea that our circumstances often affect how confidently we trust Jesus. When things aren’t going our way, we’re tempted to lean toward several spiritual dangers. Note that this is exactly what I did without even realizing it. Danger 1– We doubt what we believe. When things don’t go our way, we give more power to what we think is supposed to happen rather than to what God promises. Danger 2– We believe that God is treating us unfairly and we forget that challenges in our lives help mold us to be like Christ. Danger 3– We believe that God is punishing us for things we’ve done in the past. This thought forces us to change our behavior, thinking that we can somehow “stop” the punishment in favor of blessings, putting emphasis on our works instead of on the two things we know to be true of Christ’s sacrifice for us– grace and mercy. I am often especially guilty of Danger 3– thinking that God is punishing instead of realizing that although he allows consequences for our actions, I have been forgiven through the greatest atonement. 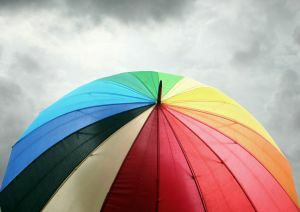 When the rain is pouring down, the umbrella that keeps me dry is the knowledge and faith in the saving grace of Christ. No matter what happens in my life, no matter what the circumstances, everything points back to Jesus. I’m being molded and shaped to be more like him. My faith is being strengthened. God’s blessings are prominent among the raindrops. After all, it’s the rain that makes the flowers grow. Share with me: Which of the three dangers above are you most likely to lean toward when raindrops are pouring in your life? **The Sunday school material we use is The Gospel Project, Spring 2013, Lifeway Publishers. And I think the thing I hate the most is that your doctor broke his hand and won’t be able to deliver your baby! I tend to lean toward Danger 1 — doubting what I believe — which then snowballs into 2 & 3. That’s why anchoring myself in the Word is so key — and surrounding myself with friends who will remind me of the truth (and pray for me when I’m forgetting it) is so, so important. Poor girl! So much to deal with right before having your baby. I love that you’re not letting it steal your joy, though, and that you’re counting your blessings! I’m possibly more likely to believe #2, because I don’t want to go through hardships. Instead of praying to be made more like Christ because of them, I often find myself praying for God to end my suffering. But it doesn’t work like that, unfortunately. WOW!! What a life lately, huh? SO nice to know that Christ IS in control and when the worlds spins around in mad circles, we can stay centered. Have mercy! You’ve been going through a lot right now! I love the truths you’ve shared. I’ve been battling some spiritual demons, and I have to remember God’s got this. Jenny, that is a lot! I’m praying for you today. I lean toward danger number one in the midst of challenging circumstances (forgetting God’s promises).